National Weather Service announces a tenfold boost in supercomputer power. 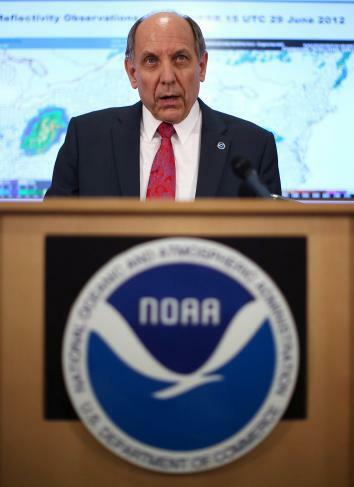 National Weather Service Director Louis Uccellini in July 2013. On Monday the National Weather Service announced a huge boost in its ability to forecast the weather, thanks to a massive new supercomputer. Once completed, the system could be the ninth-most powerful supercomputer in the world, according to TOP500.org, a group that ranks the world’s fastest computers. It’s a huge win for meteorologists—nearly every entity that produces weather forecasts in the United States, from the Weather Channel to your local TV station, relies on the National Weather Service as an informational backbone. The benefits will be almost immediate. Starting in January, the agency will launch a major interim upgrade to its flagship weather forecasting model, the Global Forecast System, which will more than double its resolution of short-term forecasts. The new system should be fully operational by October and will eventually boast a 5 petaflop capacity, nearly double what close observers of the National Weather Service had anticipated. One petaflop is equivalent to a million billion floating point calculations per second. “These supercomputing upgrades will significantly improve our ability to translate data into actionable information, which in turn will lead to more timely, accurate, and reliable forecasts,” NOAA Administrator Kathy Sullivan said in a statement. NOAA is the parent organization of the National Weather Service. The ECMWF famously out-forecast the National Weather Service in the days leading up to Hurricane Sandy’s 2012 landfall in New Jersey—with the American forecasts showing the storm going safely out to sea for several days. More than half of the $44.5 million the new system costs comes via congressional appropriations in the wake of Hurricane Sandy. The upgrade would have come sooner, but last year IBM sold its supercomputing division to Lenovo, a Chinese company. “That froze us,” National Weather Service Director Louis Uccellini recently told Mashable. Having its supercomputers made by a Chinese company raised “red flags” in Congress, so a new deal had to be assembled from scratch. Better forecasts for severe storms and hurricanes won’t just save lives—the new supercomputer promises an outsized boost to the economy as well. A 2011 study conducted by the National Center for Atmospheric Research showed that routine weather, like afternoon thunderstorms and colder-than-average days, costs the U.S. economy as much as $485 billion annually. *Correction, Jan. 6, 2014: This article originally implied that the newly announced U.S. weather forecasting supercomputer is directly comparable to one planned in the U.K. with three times the computing power. It’s not. The U.K. system won’t be entirely devoted to daily weather forecasts, while the U.S. one will.